Digital platforms appear to be omnipresent in today’s world – from food delivery companies that connect restaurants, food couriers and hungry customers via online platforms, to ecommerce retailers such as Amazon, which operate platforms that enable merchants to sell their goods to customers online without the need for physical stores. In fact, one speaks of the “Digital Platform Economy” era, which is reflected in an explosion of platform-based business models that can be observed across various industries. And at Wirecard we firmly believe that the payment industry should not be an exception. Whether you’re operating in the retail, financial services, consulting, or any other sector, this webinar will be of value to you if you are looking for ways to boost your business with a state-of-the-art omnichannel solution. Moreover, you’ll learn how the right digital platform creates the basis for great customer journeys that can be tailored to specific customer segments and their needs. 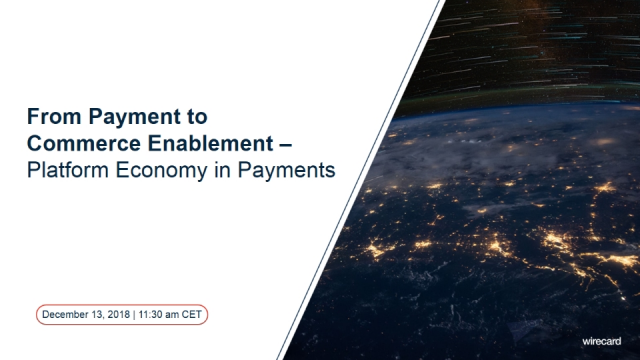 Join Wirecard’s Markus Eichinger as he explores the “Digital Platform Economy” phenomenon and showcases how Wirecard goes beyond doing payments, to fully enabling and powering businesses globally. The retail landscape is constantly changing and ever challenging. Rising costs and shifting consumer preferences have led to unexpected and ongoing casualties in the industry. Retailers, who have survived and are thriving in this competitive market, are embracing a multitude of trends and innovations, which address and capitalize on these two important points. At Wirecard, we firmly believe that the key to success is a payments strategy that underpins the overall retail strategy driving retail transformation. Join Wirecard’s Joern Leogrande, Executive VP of Wirecard Labs as he explores and demonstrates how these trends drive Retail Transformation and most importantly offer you a step change to your top and bottom line results. Today’s travel and mobility businesses have to deal with employee and customer needs in an instant and flexible manner. Having the right payout strategy in place is essential to accomplish this. Whilst various payout solutions are available on the market, only a few can deliver globally and in a fast, efficient and highly secure way. In this webinar, you will be presented with a number of different use cases from the travel and mobility industry that demonstrate how digital products can effectively replace outdated procedures. -improve the user experience for your customers. Furthermore, you will find out how the right payout card program can support operational efficiencies, security benefits and cost savings. Wirecard’s Hadi Hafez and Asmir Lukavackic will be on hand to share industry insights, walk you through instant payout methods and answer any questions. Are you ready to quit outdated and expensive payment processes? Then join our webinar! Refunds happen. But did you know they're one of the most important touchpoints of your business? With customers returning $642.6 billion in goods each year, refunds represent a huge opportunity to build customer affinity as well as retain and win back customers. Plus, you’ll learn about the costs savings, operational efficiencies, and security benefits of going digital. Wirecard’s Kevin Brown and Sean Healey will be on hand to share industry insights, walk you through digital refunds, and answer questions. Ready to make the most of your refunds? Join us. Wirecard is the global leader in innovation for digital financial technology, employing more than 5000 employees in 26 countries. As one of the world’s fastest growing digital platforms in the area of financial commerce, it provides businesses and end customers alike with a constantly expanding ecosystem of real-time value-added services. - data analytics & conversion rate enhancement. These services are available for all sales channels, including online, mobile and ePOS. Wirecard owns a number of regulated financial institutions in several key markets, and holds issuing and acquiring licenses from all major payment and card networks.